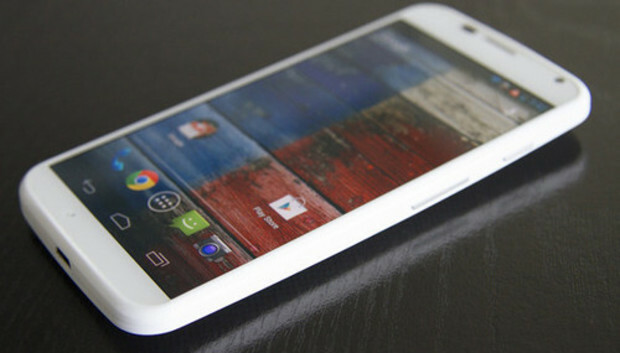 Google-owned Motorola Mobility has announced it will start shipping the Moto X in Europe at the beginning of February. The smartphone was launched in August in the U.S. Its first European destinations are France, the U.K. and Germany, where it will cost £380 ($620) or €399 without a contract. In comparison, the Google Nexus 5 costs from £299. The LTE smartphone still has a 4.7-inch HD screen and is powered by a Qualcomm Snapdragon S4 Pro dual-core processor clocked at 1.7 GHz. It also has a 2-megapixel front camera and a 10-megapixel rear camera. There is 2GB of RAM and 16GB of integrated storage. Just like the U.S. version, it will respond to a number of different voice controls and gestures. For example, users can use the voice control while driving or twist the phone to quickly turn on the camera. The smartphone also lets users view headlines and the beginning of messages on the lockscreen. The idea is that if you aren't switching on the phone fully, then you aren't draining the battery, according to James Soames, director of marketing operations at Motorola, who thinks these features will help differentiate the Moto X from competing devices. However, one thing that's now missing in Europe is Moto Maker, which allows U.S. customers to place online orders for smartphones with customized cases. However, the company is in discussions with its supply chain and partners regarding a European version of the customization service, according to Soames. "What we need to make sure when we launch it here is that it's launched properly and the customer experience is seamless," he said. Motorola has struggled to make the Moto X a success in the U.S. and has recently lowered the price to turn the tide.